Edson Silva, Honors Program student and Health Services Administration major, plans a career as a nursing home administrator. Hometown: Born in Queens N.Y, raised in Sao Paulo, Brazil, until the age of 16 and then moved to Atlanta. High School: Lithonia High School, 11th and 12th grades, where he played soccer, and Carlos Villalva in Brazil for 9th and 10th grades, where he played soccer and volleyball and was freshman and sophomore class president. Family: Ian (son - 20 years old), Christopher (son - 22), Josiah (grandson – 2), Matt Fabian (brother), Liz Fabian (sister-in-law), Faith Fabian (niece - 16). Employment: Full -time student, Carlyle Place - Navicent Health intern, Ethica Health intern. Degree Objective: Bachelor of Science in Health Services Administration with a concentration in Long-Term Care. Career Goals: "I'm planning to become a LNHA (Licensed Nursing Home Administrator) and am currently interviewing with long-term care organizations that offer AIT (Administrator in Training) positions in order to secure state licensure. I've been accepted to Louisiana State University’s MHA program and am scheduled to start classes in the spring of 2018." He chose Middle Georgia State University because … "It has a reputation of academic excellence and affordable tuition. The decision was not taken lightly. I have attended Georgia State in the past and also considered Mercer. In the end, location, quality of education, and cost made Middle Georgia State University a very simple choice. I am extremely satisfied with the quality of education I received at Middle Georgia State. I feel empowered and equipped to excel in my field." The greatest thing he discovered about Middle Georgia State was … "The caliber of the faculty and staff. All of my professors are subject matter experts in their fields and spent a good part of their lives in academia and in the private sector. This mix of academic and real-world experience added a great deal of value to the education I received at Middle Georgia State. It was worth every minute and every penny. I am confident I will recoup my tuition costs in the first few years upon graduation as a result." 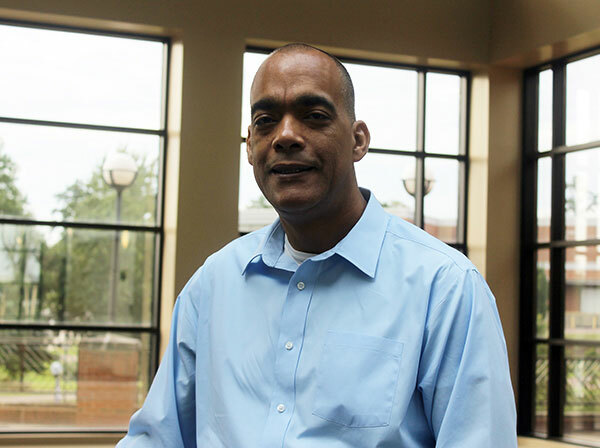 His greatest academic experience has been … "The opportunity to participate in the Knights Impact cruise to the Dominican Republic under the Experiential Learning and the International Studies departments. I strongly encourage all students to consider opportunities to study abroad. Having traveled abroad extensively throughout my life, I must say that exposure to different cultures can only add to the quality of education we receive in the classroom at MGA." To him, “greatness” means … "Overcoming personal shortcomings by maximizing one’s strengths. To die to self daily and to be of maximum use to another human being." In five years … "Immediately upon graduation I intend on securing a preceptor and facility that will allow me to earn the 1,000 supervised hours that are a pre-requisite to sitting for the Nursing Home Administrator’s exam in the state of Georgia. As I mentioned earlier, I intend to further my education by pursuing my Master of Health Services Administration. Currently, I am already accepted for the accelerated online MHA program at LSU. The program can be completed in a year and I am seriously considering going for my Doctorate of Health Services Administration. I have already looked at a number of programs and right now the program offered by the University of Mississippi seems to be the one that interests me the most. Once I obtain all of my credentials, I intend on working in the private sector for no longer than 10 years and would like to end my career teaching in a University setting. Possibly MGA. We will see how things play out."